Eid-ul-Fitr 2013 - What day did you celebrate Eid? After a very controversial end to Ramadan 2013 the date for Eid-ul-Fitr has been at the heart of most discussions in Muslim households across the world this year. Discussions with friends, families and colleagues have been never ending; so we've decided to get closer in finding out how and why some of us celebrated Eid on the days that we did. How did we really decide on choosing the day for Eid? Did we really rely upon the sighting of the new moon or were there other factors involved which played a bigger part in the decisions we've made? We have compiled a simple survey which will take you less than 15 seconds to complete with just 6 questions to answer. Please complete this survey as honestly as you can; after completing the survey you will be able to see a collective summary of how others have answered in comparison to you. We will soon collate all the answers from the survey and publish the results by next month with a detailed review and an in-depth analysis to your answers. All the answers to the six questions will be analysed individually to see how each answer has lead to the choices some of us have made. The results are already very fascinating and thought provoking to say the least! Please share this survey widely with your friends, family and colleagues. The more people we have taking part in this survey the better we will be able to understand and analyse the results. 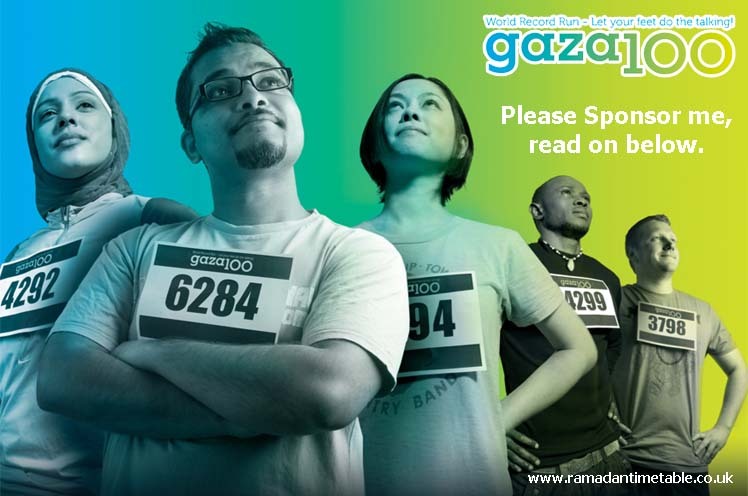 I will be participating in an event for charity which will be for the children of Gaza. It is also going to be a record breaking event for most people participating in a 24 hour relay race! I am trying to promote this event by raising awareness at the same time raise some money for the children of Gaza! 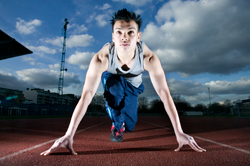 IF Charity, in association with London Tigers and MDUK are organising a spectacular record breaking attempt on May 23rd 2009 having the most amount of people (4000) participate in a 24 hour relay race! See trailer video below. The aim is to raise as much money as possible for the children of Gaza and I need your help and assistance to achieve this truly amazing ‘feet’! It is important that you mention my name in the comments somewhere so that i can keep a track of how many people have supported me, i would prefer if you put "Khalid" somewhere in your comments as there are so many of us on the list trying to acheive the same goal. Also if you wish mention where you heard about my appeal, which is from the Ramadan Timetable UK & Ireland Website. Please dont forget to Gift Aid your donation by ticking the "Gift Aid" box, this is very important. Here is a video of a Gazan child himself, this is the story of Mohammed. Reported by Save the Children. Most People Running 100 Metres in a 24 hour Relay Guinness Book of Records Official Title. Remember this is for a very worthy cause! Your help would be greatly appreciated by me and my team and most of all by the Children of Gaza. Thank you for taking your time in reading my appeal. I would like to thank all those who have helped me obtain Ramadan Timetables from their local cities and counties, you know who you are! Remember with your help this website will not have been possible, just remember your not only helping the website, but also the many hundreds if not thousands of people out there. Imagine the many people that will be able to fast not just because of Ramadan Timetable UK and Ireland, but because of you! We will have a thank you page listed here soon mentioning all those who have helped. Remember to keep visiting the website as we will have new and up to date information and tips with regards to fasting. Not only that but we will also announce official EID dates for both Eid ul Fitr and Eid ul Adha this year so you will not need to worry or debate with fellow peers whether what day Eid will be on, it takes just one click to get on to http://www.ramadantimetable.co.uk! More information about Eid-ul-Fitr will be posted nearer the end of this month.